Are you fascinated in watching the clouds? More than just captivating structures in the sky, clouds say something about the upcoming weather condition. Consider anvil clouds. What weather condition do these clouds bring? Read on to find out. Anvil clouds are characterized by a flat cloud structure on top of a thunderstorm cloud. 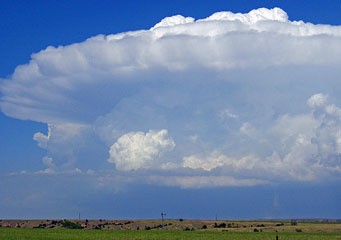 It is often used in describing gigantic thunderstorm clouds – cumulonimbus clouds which form an anvil-like shape when they mature. Anvil clouds could exist together with other cloud types like mammatus clouds. Anvil and mammatus clouds are both varieties of accessory clouds whose development and existence depend on a parent cloud. At What Height is an Anvil Cloud Found? Since anvil cloud exists with cumulonimbus cloud, it can be found at altitudes where cumulonimbus also forms. Cumulonimbus is a vertical cloud that grows anywhere between 2,000 feet and 50,000 feet from the Earth’s surface and is responsible for heavy rainfall, snow, lightning, hail and tornadoes. Likewise, anvil clouds are created within the same atmospheric altitude and the higher the altitude wherein they are found, the stronger the thunderstorm they contain. This type of cloud develops on the upper portion of cumulonimbus clouds which is the result of the spreading out of rising air which bounces off from the base of the stratosphere. This happens because the air in stratosphere is warmer compared to the air going up, therefore preventing it from rising further. In this case, the rising air has reached the equilibrium level, the time where the temperatures of the surrounding air and rising air are equal or warmer. Anvil clouds are largely made up of snow because of the cold temperature on the upper portion of the troposphere. However, the snow melts when it descends into the warmer air temperature below thus turning it into rain. An anvil cloud closely resembles a large mushroom in the sky. The distribution of an anvil cloud on the upper part of cumulonimbus cloud may have a smooth or fibrous appearance. These clouds are commonly seen in tropical and temperate regions; which means they are rarely visible in the Polar Regions. Anvils are often responsible for thunderstorms happening during the summer and spring seasons. Launching of space shuttles is suspended if these cloud formation is found within 10 nautical miles because the space shuttle and engine trail can trigger lightning. Anvil clouds are not just beautiful masterpieces in the sky. They are strong indicators that thunderstorm is advancing and you need to prepare.